We set off from Stanstead to Gran Canaria on 1st December 2007. Party members were Rex Hargrave, Tod Wurr, Aaron Elfleet, Karl Barstard, Emma Poole, Mat Galley, Gordon Weller, Adrian Weller, Samantha Skelton and Emma Cottle. After a pleasant flight we arrived at Las Palmas to a bright sunny afternoon. We then took the transport to our resort, Calla Nova in Puerto RIco, in the south of the island. After getting unpacked we wandered down to the Aquanauts Dive Centre run by my good friend J.B. and his wife Ruth. We filled in our paperwork to save us time on Sunday and watched the sun set over the sea with a nice cold beer! Sunday - We were picked up from our accommodation and taken down to the centre where we carried out our first two dives in the channel directly in front of the dive centre, just to get everyone acclimatised, and a bit of bottom time before we tackled the more serious sites that J.B. had planned for us for the rest of the week. The evening was spent having a pleasant meal all together and a few drinks in the commercial centre, basically a small mall filled with bars, restaurants and souvenir shops in the centre of Puerto RIco. Monday - We were collected bright and early. At the dive centrewe loaded up and headed to the national marine park. We carried out two dives, the first being quite a challenge entering through fairly lively surf, requiring J.B., his right hand man, Hanz and myself to get us all in safely. However it was worth it, the dive on the reef was great. The second dive was done just around the corner from the first site but still in the marine park. Not such a difficult entry but the visibility was not so good. After what was a tiring day we ended it with yet another good meal together and a couple of quiet drinks before heading home for a well earned sleep. Tuesday - We started early as this was to be our first boat dive of the trip, totally new ground for everyone apart from myself. The rib ride to the first site was great, the first site was the Mogan wrecks; these were two fishing boats about 600m from the shore. The shot line was dropped a few yards away from the bow of the first wreck, the largest of the two. Everyone deployed around the wreck in three group. Some on their Advanced course doing their wreck dive and two diving nitrox. Unfortunatley air was running out so none of us made it to the second wreck. The second dive was made on Aquiligan reef, a 10 minute rib ride in the opposite direction to the wrecks. The rib ride was a little more choppy and the current fairly strong, but viz was good and the fish life in abundance. Wednesday's diving was on a reef called Passito Blanco, superb. 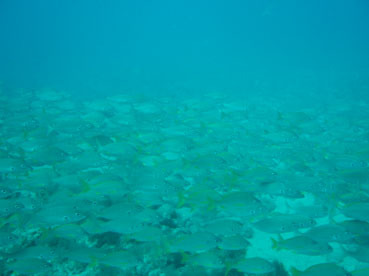 The fish life here was also great with everyone seeing an Angle shark, Rays, Octopus and massive shoals of Cow Bream. The seocnd dive was carried out on another wreck called The Meteor, or Russian wreck, as it was shipwrecked by a Russian chap who had a bit too much to drink and took it out of the harbour and wrecked it on the reef!!! On Wednesday evening we carried out a night dive in the channel. Only 5 of us took part and for all of them it was a first. Mixed reactions but on the whole most of us enjoyed it. We followed the days diving with a barbeque at the dive school with Karl doing the cooking and making a fine job of it!!!!! Thursday's diving was on the rib again with our roughest ride yet with everyone feeling like they were still on the rib the next morning!!! We went out to the artificial reef. This was created by the university here to see which shapes attracted the most fish life. Unfortunately all the shapes attracted loads of fish life straightaway so the experiment didn't work!!! The second dive took us back to the Mogan wrecks again and we dived the wreck we didn't see the first time. The evening resulted in us having a really good Chinese. Friday - J.B. offered anyone who wanted to dive a free dive in the channel. Karl, Aaron, Gordon and myself took up the offer and were rewarded with a super dive with good viz. Most of the party came down to the dive centre during the dayand spent it sunning themselves and a bit of snorkelling. The final evening we gathered for a meal at a Greek restaurant recommended by Hanz. We were joined by J.B. and Ruth and we had a greta meal in great company. I gave away a couple of deserved awards. The most improved diver this time went to Sam and the diver who displayed the most courage went to Emma Poole. Saturday - We gathered ourselves together after a good night out and headed back to the airport. The flight was on time and the team slept most of the way home!!! After finding our cars in the airport car park, we all made it safely home. Congratulations go to Karl and Aaron for compleating their Nitrox speciality, also to Tod, Mat and Emma for compleating their advanced course, and everyone else a big well done generally.